ウォーリーを さがせ! © 1992 Sega. Runs on the Sega "System 18" hardware. Wally wo Sagase was released in June 1992 in Japan. Based on the children's books called 'Where's Wally?' 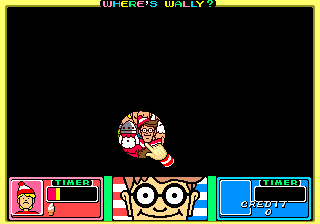 where you had to find Wally (Waldo in US) in various drawn scenes.